After the release of their latest album, Down The Way, Australian singer-songwriter duo Angus & Julia Stone have gotten increasingly popular in the US and UK. That is to say, if you listen closely in the movie 'Easy A' you can hear part of “Big Jet Plane” while one of the main characters scans the radio. Angus & Julia Stone are one of the many artists out there that don’t get half as much popularity or attention as they deserve. The single off their latest album, “Big Jet Plane,” is arguably the perfect love song. The song starts off with violins playing slowly while Angus sings, “Gonna take you for a ride on a big jet plane.” And, for anyone who loves artists with a singer/songwriter feel and unique voices Angus & Julia Stone are perfect for you. 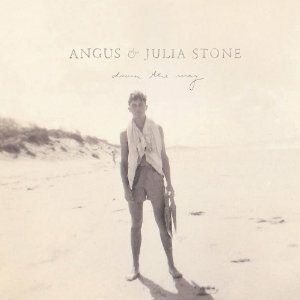 On their latest self-produced album, Down The Way, Angus and Julia (who are siblings) switch off singing songs on the album and both of their voices are incredibly unique. While Angus’ voice is high with a tinge of roughness to it, Julia’s voice sounds like a very young, innocent girl. Perhaps this would sound strange to someone who hasn’t heard Angus & Julia Stone. The uniqueness of their voices are almost shocking at first and may take a while to get used to, but the music is something that should not be missed. Many of the songs off Down The Way have a sweet melody in the background, as either Angus or Julia slowly sings great lyrics about love, travel, and California. There is not a song on the album that I do not love and though they are relaxing and slow there is a subtle energy to each one. There are parts in songs like “Yellow Brick Road” where the lyrics break off and they go into a long, ambient instrumental break with beautiful and almost jazzy guitar in the background. Though Angus & Julia Stone are most popular in Australia (signed with EMI Music Australia and having reached #1 with their latest release); they are also currently touring in the UK and the US. I can only imagine how beautiful the music would sound live. Down The Way is by far one of my favorite albums at the moment. I’m sure Angus & Julia Stone won’t disappoint with their next release and will perhaps get all the attention they deserve.